Is Iraqiyya a Sectarian or a National Party? After having previously dismissed it useless, Ayyad Allawi has recently expressed a renewed interest in the stillborn strategic policy council as a way of influencing Iraqi politics. Today, creating the council and furnishing it with real power are apparently once more official goals of his Iraqiyya coalition – which aspires to be the number one secular political movement in Iraq, but emerged in the last elections with markedly heavier support in Sunni-majority parts of the country than elsewhere. Leaving aside for a moment the would-be council and the legion constitutional problems involved in its creation (it is not even mentioned in the constitution of 2005 and would need confirmation by popular referendum before it could attain any real power), it can be useful to look at what sort of political demands accompany the demand for Iraqiyya as a prerequisite for “staying committed to the political process”. One item that stands out in particular is the requirement that there be “balance in the ministries of state” (التوازن في وزارات الدولة) . This is a concept that has popped up over and again during the past few weeks in relation to the endless discussion about a possible summit between Allawi and Prime Minister Nuri al-Maliki for the purpose of healing rifts in the still-emerging “government of national unity” whose formation started as long back as last November. What exactly is meant by this “balance” is not entirely clear, but almost regardless of interpretation it will bode ill for the future of Iraqi politics and the status of Iraqiyya as a nationally oriented party. In a more limited definition, it might refer to “ministers of state”, of which Iraqiyya has just two (which is less than Maliki’s State of Law). This sounds like a demand for more positions for Iraqiyya just for the sake of positions, and would be an affront to the limited Iraqi spring and the criticisms of a vastly oversized government that have accompanied it. It could also refer to ministries more generally, but the problem is that Iraqiyya has got more of them than anyone else, with one sovereign ministry (finance and possibly defence in addition), plus six regular ones (agriculture, communications, education, electricity, industry, science & technology). In a recent interview, Ahmad Abdallah al-Jibburi of the Iraqiyyun (Nujayfi) faction of Iraqiyya presented yet another interpretation, and it is not a more promising one: In his view, there should be “balance (tawazun) in the institutions of state, and each governorate should have an entitlement in the security ministries proportional to its share of the population”! Whatever interpretation is chosen, focusing on the concept of “balance” in the Iraqi government almost inevitably will mean making it even bigger, since the aim is to satisfy demands for quotas – whether as ethno-sectarian, party-based or governorate-specific shares. It is particularly worrying to hear Iraqiyya leaders focusing on this concept now since its inventors in post-2003 politics, the Kurds and ISCI who were the first to bring it into the constitutional rhetoric, arguably have less in the way of ministries today than their electoral result should give them based on a quota logic (especially the Kurds). It also comes at a time when Iraqiyya leaders at the local level appear more ready than ever to challenge the powers of the central government, whether in the name of the existing governorates or even in schemes for federal regions (including unprecedented demands that Iraqi security forces be withdrawn from certain areas). But that is unfortunately the direction we are heading in after Iraqiyya, with American support, opted to join an oversized “government of national unity” instead of talking directly to Nuri al-Maliki about a more narrow coalition in the summer of 2010. 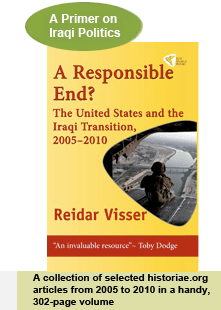 There really seems to be no way out of this process towards ever more government (and less governance) unless the Kurds tell Iraqiyya what Iraqiyya apparently cannot understand themselves – that Iraq would function better as a straightforward asymmetrical federation where the Kurds would focus on the interests of the Kurdistan Regional Government only instead of constantly bringing Iraqiyya into taking illogical positions that prevent it from talking seriously to Maliki and staying true to its supposedly nationalist agenda. So far, of course, the Kurds have been pursuing a policy of maximum fragmentation in post-2003 Iraq, but possibly the realisation that Iran would ultimately gain from this could make them reverse their stance? And of course, Maliki would need to clean up his act as well: His latest decision to form a special military force for the Tall Afar area in Nineveh seems more calculated to resonate with Shiite sectarian interests there than anything else. As a very minimum, there should be constitutional revision that would clear up the contradictions between article 115 and other parts of the constitution concerning the difference between a federal region and an ordinary governorate: This might perhaps make the alternatives clearer and prevent Iraqiyya from continuing along its current path which will eventually turn it into the ISCI equivalent of the Sunni-majority areas of Iraq, with a narrow focus on sectarian interests (for more on this problem, see here). So far, however, there are no signs that Iraqi politicians are prepared to even reopen the pathetic constitutional revision dossier prepared by the previous parliament, and as long as Iraqiyya keeps talking about “balance” there really is no hope that even such a revision could set Iraq on a more promising course.